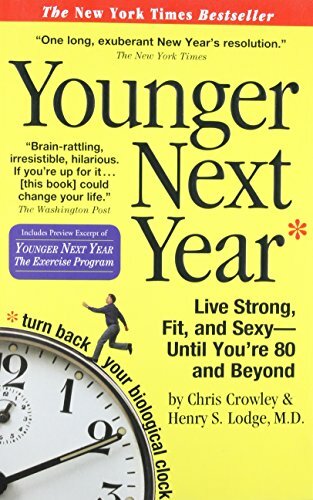 Announcing the paperback edition of Younger Next Year, the New York Times, USA Today, Wall Street Journal, and Publishers Weekly bestseller, co-written by one of the country’s most prominent internists, Dr. Henry “Harry” Lodge, and his star patient, the 73-year-old Chris Crowley. These are the books that show us how to turn back our biological clocks—how to put off 70% of the normal problems of aging (weakness, sore joints, bad balance) and eliminate 50% of serious illness and injury. The key to the program is found in Harry’s Rules: Exercise six days a week. Don’t eat crap. Connect and commit to others. There are seven rules all together, based on the latest findings in cell physiology, evolutionary biology, anthropology, and experimental psychology. Dr. Lodge explains how and why they work—and Chris Crowley, who is living proof of their effectiveness (skiing better today, for example, than he did twenty years ago), gives the just-as-essential motivation. “I have lost 50 pounds over the last nine months by eating less, moving more, and changing the way I think. I am 62 and look better and feel better and have more energy than in the last 15 years.”—Ron T.
” I read the wisdom put forth by Chris and Harry . . . [and] my next physical blew my doctor away. I am 74 and in better shape than when I was 50.”—Jack S.
“Not a week goes by that I do not utter a silent prayer of thanks that Younger Next Year came into my life. You guys are saving the world one body at a time.”—T. G.